I once watched a 2005 film called The Proposition. Now, that’s not the 1998 The Proposition starring Kenneth Branagh & Madeleine Stowe, nor is it either of the films called The Proposal, one starring Sandra Bullock and the others starring Jennifer Esposito. No, this is the gritty, Australian, Western, crime/suspense film starring Guy Pearce, Ray Winstone, & Emily Watson. It’s a damn fine movie, filled with the beautiful Outback, the harshness of the land, the terrible danger that the people of the area lived in every day, and the swift & cruel punishment for those outlaws who were actually caught. I recommend watching it, at least to those who enjoy a little minimalism, solid acting, and a harsh plot. 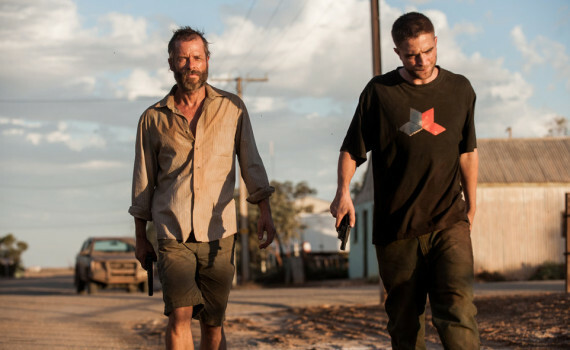 And if you’re interested in a slightly more modern take, a post-apocalyptic version of basically the same story, then look no further than The Rover. In the near future, an economic & societal collapse will turn the world into a new Wild West. In Australia, this means few people, miles of empty land, criminals taking what they want, and every man defending himself with his own gun & his own wits. Death is constantly at the door, and there aren’t any laws that apply anymore. For our title character, all that exists is his car and the places he can stop for a drink. But when, randomly, a group of men who have just pulled off some sort of heist crash their truck nearby, his car seems ripe for the taking. They steal it with ease & are on their way, little expecting the ferocity that a man with nothing to lose can exhibit when you cross his path. Again quite randomly, the Rover comes across the dim-witted brother of one of the men who stole his car, forcing him to come along on his quest for vengeance perhaps, justice maybe, or possibly only the joyless act of killing. This film reminded me of The Proposition in so many ways. Guy Pearce was in both, that’s an obvious one. Both are set in Australia, both are during mostly lawless times when some men are trying to hold on to a semblance of the old order. Both follow a story in which brother attempts to kill brother. And both are told with a slow intensity that is so very rarely appreciated. The music and the mood are both so full of dread, of impending doom that we know can’t be avoided. It’s a story that you understand can’t end beautifully, that will kill so many along the way. Pearce does a tremendous job as the lonely drifter, never making the role as corny as it could have been. And Pattinson as the slow younger brother delivers the best performance I’ve ever seen out of him. For my money, The Proposition is better, but only marginally, and perhaps you’re preference for either Westerns or Dystopias will ultimately decide which one you enjoy more.